This 2,200 square foot farmstand building comprises a retail grocery storefront, commercial-grade commissary kitchen, and community gathering hall. 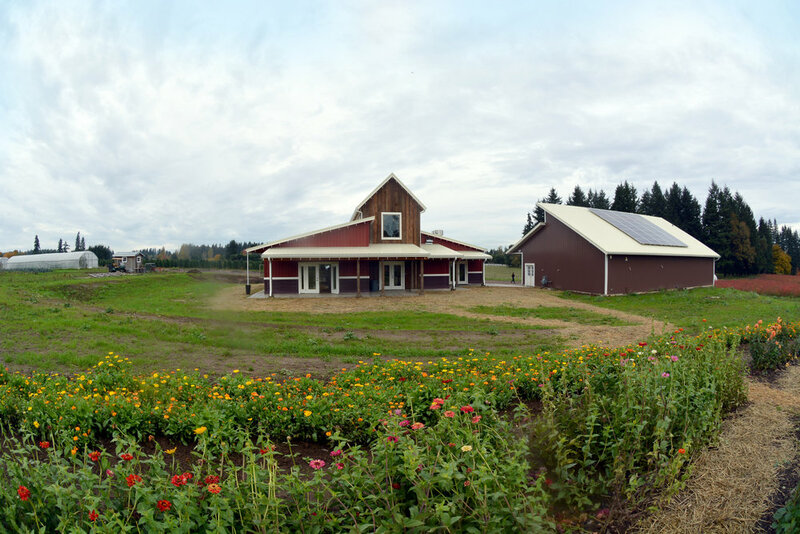 As just one aspect of Our Table Cooperative’s 58-acre regenerative farm, this farmstand is the hub for bringing Oregon products to the local community of shoppers. Sitting adjacent to a packing shed and produce storage facility (designed concurrently with the farmstand), it is surrounded by hoop houses, u-pick flowers and blueberries, and acres of Organic crops. It truly embodies the farm-to-shelf story of local, healthy products. Integration of salvaged heavy timber from the site was a focus in the building design, resulting in an elegant central atrium with operable clerestory windows that facilitate passive cooling strategies. Paired with high-performance detailing including advanced framing techniques and super-insulated walls, the building envelope is very energy efficient. The design seeks to blend traditional and contemporary aesthetics, incorporating salvaged lumber from the site and adding a playful twist to the form and color of the classic farm building. Wrap-around porches allow activity to spill outside year-round. A memorable place for local community-supported agriculture.